This Case History covers a system built in 1998 for a major remanufacturer of power steering assemblies. The customer had to remove dirt, grime and oxidation from housings and internal components prior to inspection and oil and chip from machined components before assembly. Thousands of theses assemblies were to be washed, rinsed and dried in batch loads handled in standard baskets. Furthermore, the customer had specific requirements including paint color, stack lights, electrical components and flow orientation (the line had to run right to left versus the traditional left to right flow) for compatibility within their existing factory. The process is wash, rinse and dry. The operator controls are located at the front of each station in Nema 4X enclosures oriented horizontally for ergonomics. Motor controls, fuses, timers, temperature controllers and lockout-tagout disconnects are located at the rear of each station in Nema 12 enclosures. The system includes roller conveyor sections on each transport elevator for smooth and easy transfer between stations without having to lift baskets. Digital cycle timers and power pneumatic covers are sequenced with the oscillating elevator. Each station is fully automatic. The operator simply loads, presses a start button and walks away. 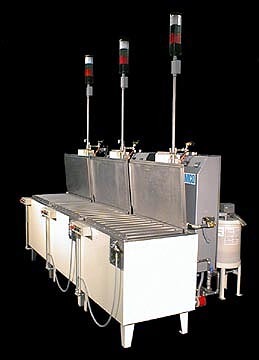 Other features include emergency stop buttons for each station and spray guns for the wash and rinse stations to detail specific problem areas. The standard oscillation washing is used in conjunction with a TurboFilter System. The turbo uses a high volume all stainless steel Gusher pump with cast stainless housing. Closed looped manifolds with multiple injectors direct solution to the working zone. The turbo system provides an even flow of high volume solution over, under, around and through components. The flow is adjustable. Ramco turbo systems are proven to accelerate processing time in washing and/or rinsing. The filtration systems include dual stainless steel filter canisters with large capacity bag elements. Each is equipped with a stainless steel oil filled pressure gauge. The application also includes a SurfaceSweep Oil Removal System. SurfaceSweep is a comprehensive method (using a lateral flow sweep header and large overflow dam) for removing floating oils from the surface of the wash station and into a remote quiet tank for separation. 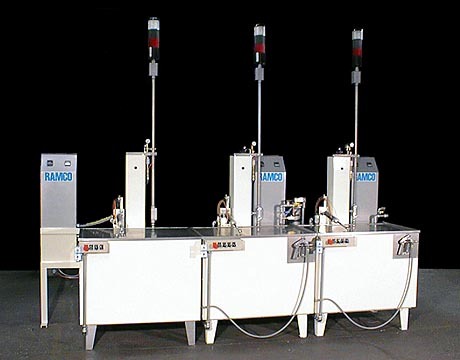 Our latest version (Model OR6A – above right) is both a decanting and skimming system. It is an excellent value (including all stainless steel piping and return pump and a stainless steel deep belt skimmer). The system is designed to trap oil in an offset polypropylene quiet tank. The quiet tank has its own stainless steel pump to discharge oil free detergent through a sweep header strategically located in the washing chamber. The reflux of fresh solution creates lateral flow across the surface of the bath. The flow directs surface oil into a large overflow dam built into the opposite wall of the washing chamber. Oil-detergent emulsions further separate in the quiet tank and the oil settles to the surface. A stainless steel belt skimmer automatically removes the accumulated oil into a separate collection container. SurfaceSweep prevents floating oil from redepositing onto cleaned parts.